Antique quilting meets modern method. 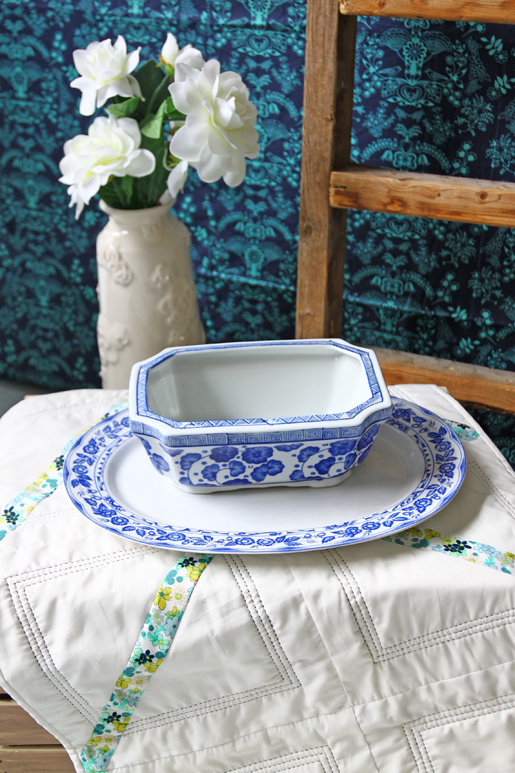 We all cherish hand-quilted antiques but we don’t always have the time to honor this wonderful tradition. Luckily, there is a faster way! 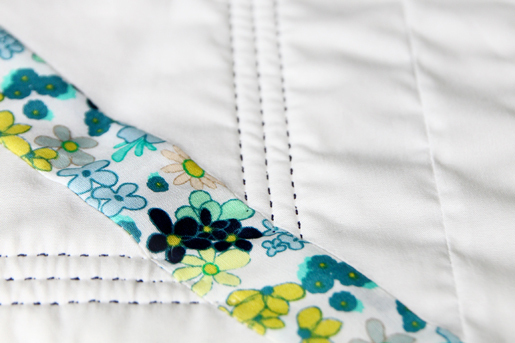 Recreate the traditional look of bluework with a hand-look stitch on your sewing machine. 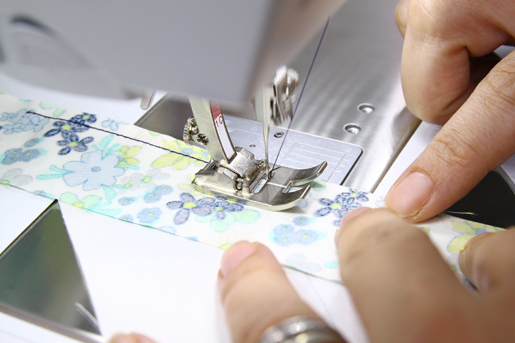 Better yet, use the “irregular” version of the stitch if it’s available on your machine. 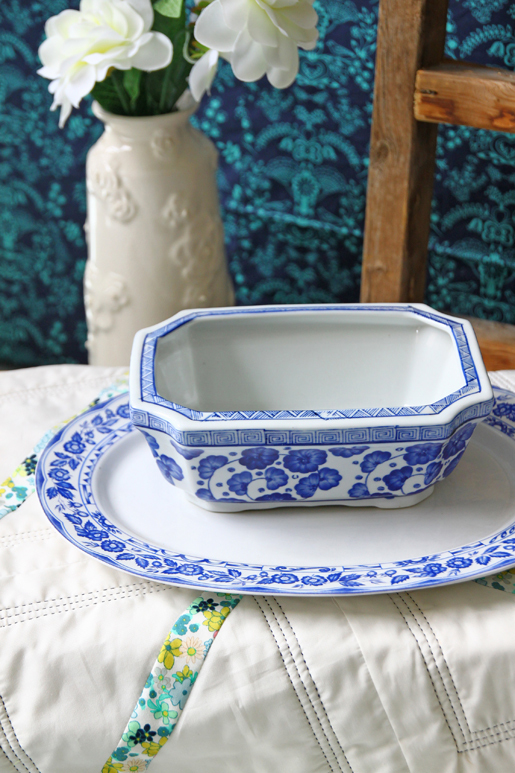 Revive tradition and create the heirlooms of tomorrow. step 2) Mark the triangles. 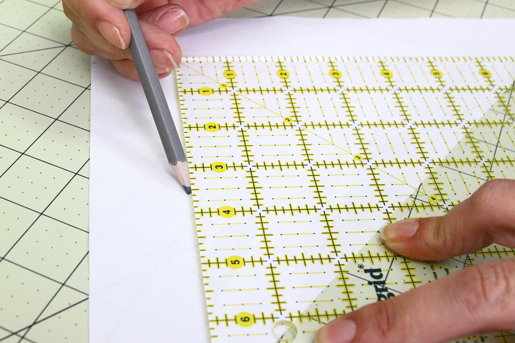 On one large triangle, use a washout fabric marker to draw a line 1-1/2ʺ from one short side. Repeat, drawing a line 1-1/2ʺ from the other short side of the triangle. 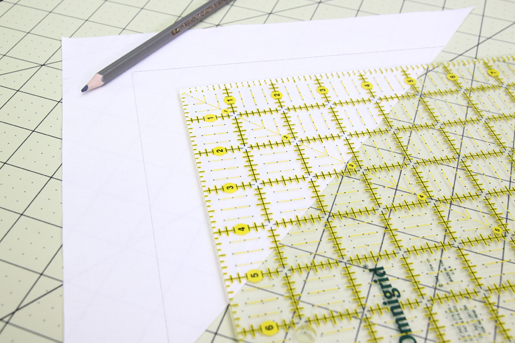 Draw two more lines on each side, spacing them 1/4ʺ apart. 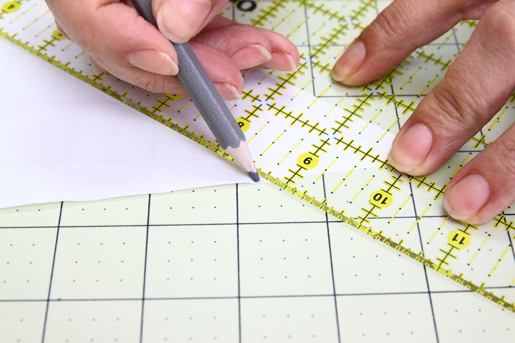 Tip: For a more irregular, hand-stitched look, vary the amount of space between the lines. step 3) Piece the blocks. Take two marked triangles and one floral print strip. Fold the strip in half; finger-press to mark the center. 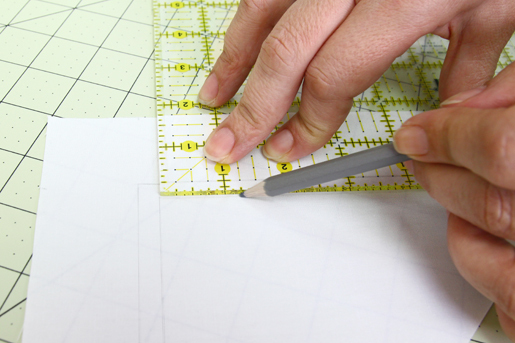 Fold each triangle in half; finger-press to mark the centers. 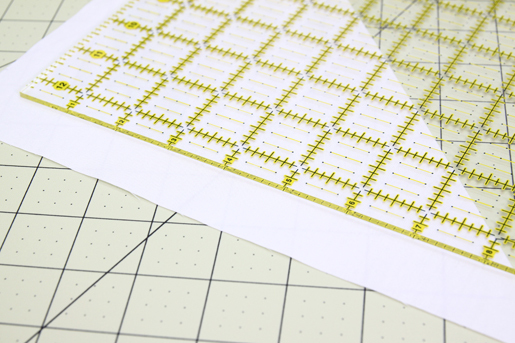 Pin the strip right sides together with one triangle, matching the creased centers and aligning the raw edges. Stitch the strip to the triangle. Repeat, stitching a second triangle to the opposite edge of the print strip, matching the creases and aligning the raw edges. 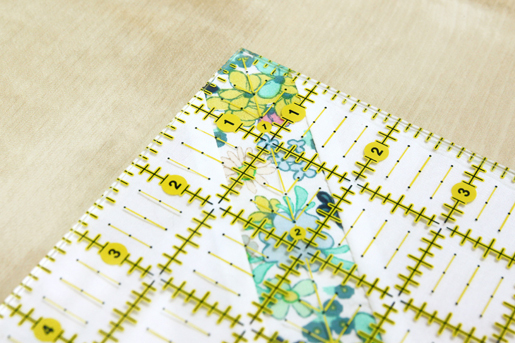 Using the rotary cutter and square ruler, trim the excess fabric from both ends of the print strip. Repeat for the remaining pieced squares. step 4) Assemble the top. Using your design wall (or a large flat surface), play with the placement of the blocks, creating a pattern you like. I arranged mine as shown in the photo. 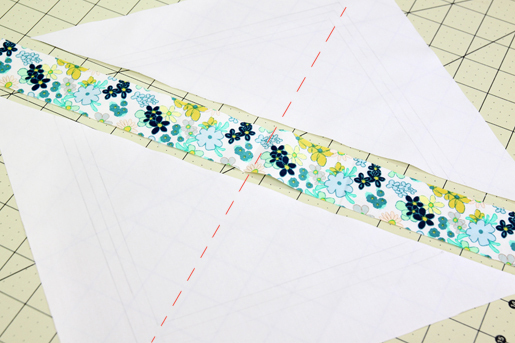 Stitch the blocks together using a 1/4ʺ-wide seam allowance. Give the top a good press with steam. step 5) Quilt the layers. Attach the walking foot to your machine (or attach Reverse Pattern Foot #1D and engage Dual Feed). Tip: With BERNINA Dual Feed the top and bottom layers are fed simultaneously, making it easy to perfectly match stripes and plaids. 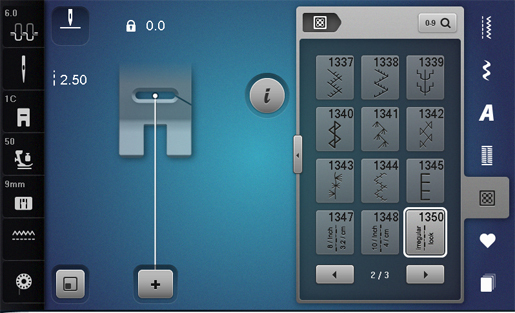 Select a handlook quilt stitch; adjust the settings as indicated in your owner’s guide. 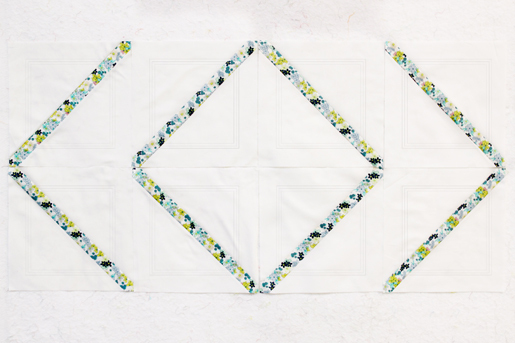 Tip: The handlook quilt stitch has infinite variations. 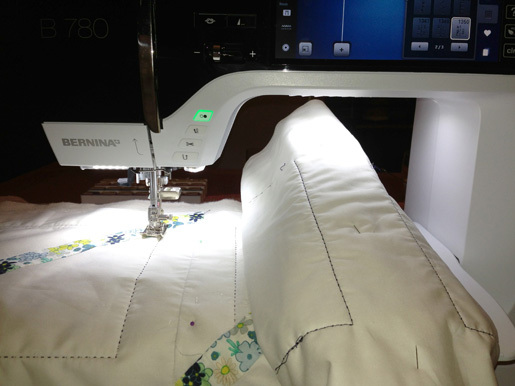 I chose an irregular hand-quilt stitch, #1350 on the BERNINA 780. I love this stitch! It gives the same look as if you were quilting by hand. Make it longer or shorter as desired; I used a stitch length of 3.0 mm. Stitch along the lines drawn on each of the blocks. Use a size 80/12 Microtex Sharp needle. 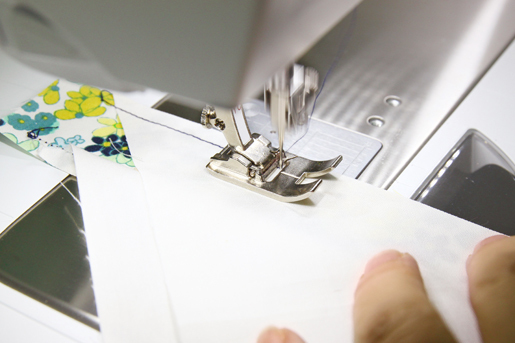 It penetrates the fabric more easily, improving the stitch’s appearance. To show this stitch at its best, use monofilament thread in the needle. If that’s not available, use a fine thread that exactly matches the color of the top fabric. Use a bobbin thread in a very contrasting color. The needle thread tension must be tightened when using this stitch, pulling the bobbin thread to the top to create a stitch that looks “hand-stitched.” The default tension for this stitch is 6.0, but I found it useful to reduce the needle tension. Reduce the motor speed and stitch slowly. A very cool effect can be achieved by pressing the basting icon; this has a subtle look, as the stitches are very tiny. step 6) Complete the quilt. 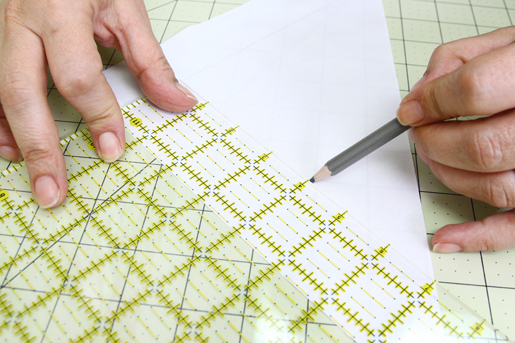 When finished quilting the runner, remove the marks from the stitching lines. Bind the runner using your favorite binding technique. 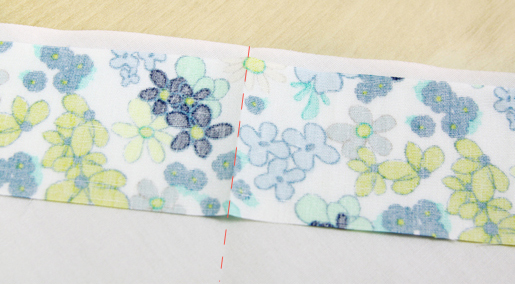 Did you stitch around the blue flowered fabric (stitch-in-the-ditch)? Are the ends of the runner straight or curved? I’m working on this now, it’s coming out lovely. I wanted to know which wash-out fabric marker do you use? I have a dozen different ones at home and some of them dry out instantly, some stick on the fabric and others don’t stay sharp!